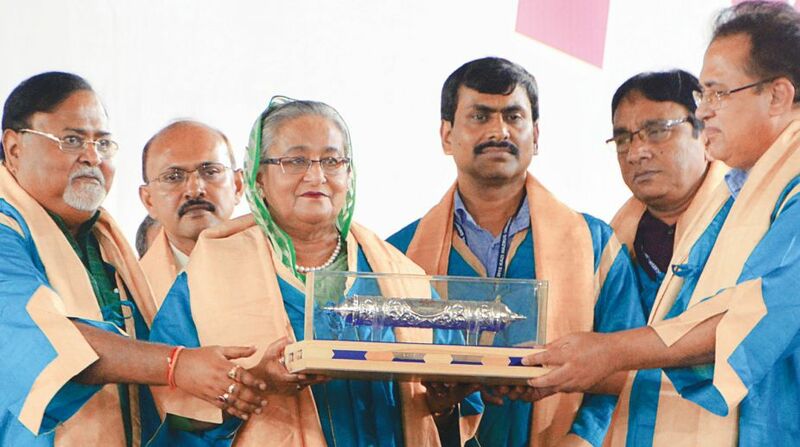 The two Bengals have been separated by partition, but Rabindranath Tagore and rebel poet Kazi Nazrul Islam have transcended such division and are equally popular and accepted on both sides of the border, Bangladesh Prime Minister Sheikh Hasina said on Saturday. Ms Hasina was speaking at the special convocation of Kazi Nazrul University here where honorary D.Litt was conferred on her. In her message to university students who received medals and certificates she urged them to rise above communalism, narrow-mindedness and become true human beings. She recalled that in 1999 she had received Deshikottama from Visva Bharati University in Shantiniketan and visited Nazrul’s birthplace, Churulia during his birth centenary year. “Yesterday we celebrated his birth anniversary in Bangladesh. Kazi Nazrul Islam was a multifaceted genius. He was a poet, lyricist, novelist, singer, dramatist, actor, director, singer, journalist, editor and a soldier,” Ms Hasina said. “My dream is to alleviate the poverty and make further developments of the sub-continent. India- Bangladesh should work jointly for the benefit of mankind,” she said. She iterated that the repatriation of about 1.1 million Rohingyas staying in various camps in Bangladesh back to Myanmar is a burning issue and sought India’s assistance in this regard. In an effort to tackle poverty in Bangladesh her Awaami League-government has worked hard to increase the literacy rate from 45 percent to 65.5 percent during her previous term and in the current term it has increased to 72 percent, she said. “Only education can alleviate poverty in your country. In Bangladesh we have set up multi-faceted universities in districts ranging from technological, medical, agricultural, engineering and maritime,”she added. Justifying her acceptance of the proposal to confer the D.Litt from Kazi Nazrul University in Asansol she said she did not think twice as it was Kazi Nazrul Islam who had motivated his father Bangabandhu Mujibur Rahman, who was instrumental in making Kazi Nazrul the national poet of Bangladesh in 1972. “The date of convocation is also very touchy as today(Saturday) is also the 119 th birth anniversary of the national poet of Bangladesh,” she said. “During my childhood I used to meet my father in prisons as he was fighting for independence. I was very young when my family members were murdered. I was staying at Germany when the then Prime Minister of India Indira Gandhi provided us shelter. She and Indian soldiers stood beside the liberation army in the freedom struggle of Bangladesh which I can never forget,” she said. State education minister Partha Chatterjee said that chief minister Mamata Banerjee was trying to make education truly global and of international standards. Already 22 universities have been set up and four more universities will shortly come up at East Midnapore, Jhargram, Alipurduar and Jalpaiguri. Mr Chatterjee said that the secretary of Governor K N Tripathy informed him earlier in the day that the Governor had been taken ill last evening after he returned from Shantiniketan. The Governor is the chancellor of the university. CM Mamata Banerjee couldn’t make it to the convocation. Vice Chancellor of KNU, Professor Sadhan Chakraborty handed over the D.Litt degree to PM Sheikh Hasina in the absence of the chancellor.